Arsenal enjoyed a record turnover during 2016-17, taking an incredible £422.8million – an increase of more than 20 per cent on the previous year. 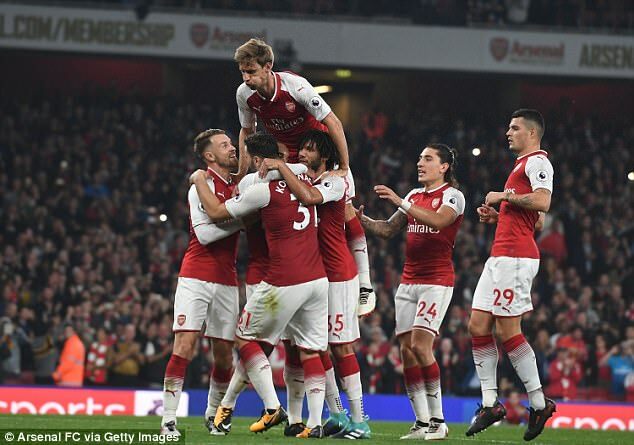 The Gunners also increased their profits for the year from £2.9m to an impressive £44.6m as they missed out on the top four but won the FA Cup under Arsene Wenger. Arsenal have, however, seen their cash reserves fall from £226.5m to £180.1m, while their wage bill rose by £1m to £195.4m. The club spent almost half (47 per cent) of their total football revenue on wages during 2016-17. 'We are well placed to compete at the highest levels on & off the pitch... we have an outstanding squad,' Arsenal CEO Ivan Gazidis said. The Arsenal chief will face the club's shareholders at the Emirates alongside Wenger and majority shareholder Stan Kroenke on October 26. He also revealed that the club's net spend on transfers over the course of the past three seasons has exceeded £200m. In 2016-17 alone, the £35m acquisitions of midfielder Granit Xhaka and defender Shkodran Mustafi helped the London club rack up a a net transfer spend of £102m. These are being offset, to a small extent, by an increase in the loan fees the club have generated in recent years. The amount they received by loaning out the likes of Joel Cambpell and Jack Wilshere more than doubled during 2016-17. They made £6.9m before taking into account the money they saved in wages on those players.